How long do I have to sue or start my accident case? How long will it take to settle my case if it doesn't go to trial? Should I see my doctor after the accident? 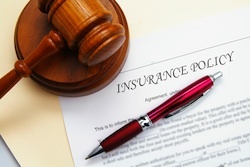 What is the difference between an accident benefit adjuster and a tort adjuster? This is the body of law deals with hurt or injured people. It includes the fields of tort law, civil litigation, municipal liability, product liability, sexual harassment, accident benefits, long term disability and medical malpractice. You may have a claim if you have been hurt in a: car accident, boating accident, motorcycle accident, slip and fall or medical procedure. You may be able use the legal system to collect compensation or benefits from the at-fault party or insurance company responsible for paying out such claims. You may also be entitle to compensation from your own insurance company ( car insurance, home owners insurance, workplace insurance, long term disability insurance). The injury can be physical in nature like broken or fractured bones, soft tissue injury, brain injury, chronic pain, loss of limb, quadriplegia or wrongful death. The injury can also be cognitive or psychological in nature, such as depression, anxiety, suicidal ideation, sadness, memory loss, fatigue, impaired concentration, dizziness, sleep problems, nightmares, moodiness, rage or temper problems. 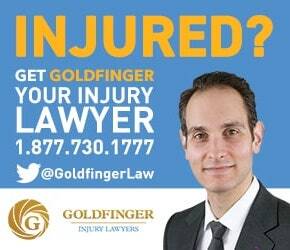 The sooner you call Goldfinger Injury Lawyers, the better. Every case is unique and every case presents itself with its own set of limitation period challenges. We urge clients to contact us right away so we can deal with these limitation periods to start your claim before they have elapsed. If you miss a limitation period in your case, there is a strong probability that the Court will dismiss your claim and order you to pay the other side's legal costs. Nobody wants to see this happen. Generally, in Ontario, car accident victims have 2 years to start an action against the at-fault driver. But, there are other limitation issues when dealing with car accident cases. There is a 30 day limitation period to submit your Application for Accident Benefits. Insurance companies also demand medical records within 10 days or they will cut off benefits. They may also request updated Disability Certificates OCF-3's from your family doctor within 30 days or else you benefits will get cut off. Car accident cases are different from municipal slip and falls - which have a 10 day written notice period followed by a 2 year limitation period. As mentioned, each case has its own unique limitation periods. Call our injury lawyers to get more specific and detailed answers about your particular case. Every person is different, every case is different and every injury is different. There are no quick and definite answers to this question. We would love to get you a million dollars for your case right away, but the reality is that the law and insurance companies simply don't work this way. Unlike in parts of the United States, there are caps on pain and suffering awards in Canada. In Canada, damage awards for pain and suffering are capped at around $310,000-$330,000. This is the absolute maximum that the courts will award for a pain and suffering claim. In Canada, there are NO CAPS for: damages for future and past loss of income; past and future attendant care; past and future care costs; loss of competitive advantage in the workplace and other variables not associated with pain and suffering damages. These damages will be added to the pain and suffering award (general damages) to increase the total value of your claim. 99% of all personal injury cases settle outside of the courtroom without ever going to trial. However, some cases need to go to trial because both sides are so far apart and there are too many contentious issues such as liability, damages, causation or the credibility of the parties. Results at trial are always uncertain. There is no "sure thing" in Court of law. Anyone who tells you differently or that your case is a "slam dunk" doesn't know what they're talking about. The lawyers of Goldfinger Injury Lawyers have conducted countless accident trials against insurance companies. Trials are grueling, and never easy. But we have tackled insurance companies head on and come out on top for our clients. We continue to challenge insurance companies every day to get the best results for our clients. It's what we do. Every case is different. Some cases can take many years to settle; particularly the more serious injury cases. Brain injury cases, loss of limb and catastrophic injury cases requiring long term care take a long time to resolve given the nature of the injuries and the complexity of the medical issues. Other cases can take a few months to settle; this applies more to smaller cases where liability is not an issue and the injuries are not catastrophic in nature. The time it takes to settle a case depends on he nature of the case, the extent of the injuries, the extent of your recovery, and how the insurance company or adjuster perceives you and your case. At the end of the day, cases are long marathons - not sprints. Insurance companies do not like paying people quickly for their injuries. If our accident lawyers could get you millions and millions of dollars the day after the accident, we would do so. But, this is not how personal injury cases work, nor how insurance companies operate. Insurers are meticulous and would rather wait it out until all of your documents have been collected and reviewed and scrutinized time and time again. Some cases can take years and others can take months. It all depends on your case. You should see a doctor if you are hurt or injured. This has nothing to do with your case. It has to do with your health and personal well-being. The logic is that hurt people or sick people seek medical attention while healthy people do not. Insurers or Courts are quickly to draw an inference between people who don't see their doctor and those who are not in pain. If you don't have a family doctor, then go to a walk in clinic. If there isn't a walk in clinic near by, then go to the emergency department at your local hospital. I know that the wait in the emergency department will take forever, but if you're really hurt, then getting the proper medical attention is paramount. Both tort adjusters and accident benefit adjusters work for car insurance companies such as State Farm, Economical Insurance, Aviva, Co-Operators, The Personal, Intact, TD Meloche Monnex, Belair Direct, Liberty Mutual, Wawanesa, CAA Insurance, but work in different departments. One adjuster works in the accident benefits department. The other adjuster works in the pain and suffering, or bodily injury department. They may work in different departments of the same company. They may work for completely different companies. In most cases, the accident benefit adjuster will be the insurance adjuster from your own or from your spouse's car insurance company. They will be responsible in administering your no-fault accident benefits arising from a car accident. These accident benefits include, but are not limited to, income replacement benefits ($400/week); attendant care benefits ($1,500/month) and housekeeping benefits ($100/week). A tort adjuster works for the insurance company from the driver or the responsible party which hit you. They are not responsible for accident benefits. They handle the tort part of your claim, which includes, but is not limited to, damages for pain and suffering, past/future loss of income, loss of competitive advantage, Family Law Act Claims or any other heads of damages which are not covered by accident benefits. If both accident benefit adjuster and tort adjuster work for the same company, there is a "Chinese Wall" erected between the adjusters which is supposed to eliminate all communication between adjusters about your specific file. The insurance company may be liable for bad faith damages in your claim if the adjusters are found to be colluding, communicating or collaborating on your case without your consent. Our lawyers can give you more information on what sort of behaviour constitutes bad faith when there is collusion between insurers, collusion between adjusters in the same company, or simply bad faith claims handling of your claim. It happens.